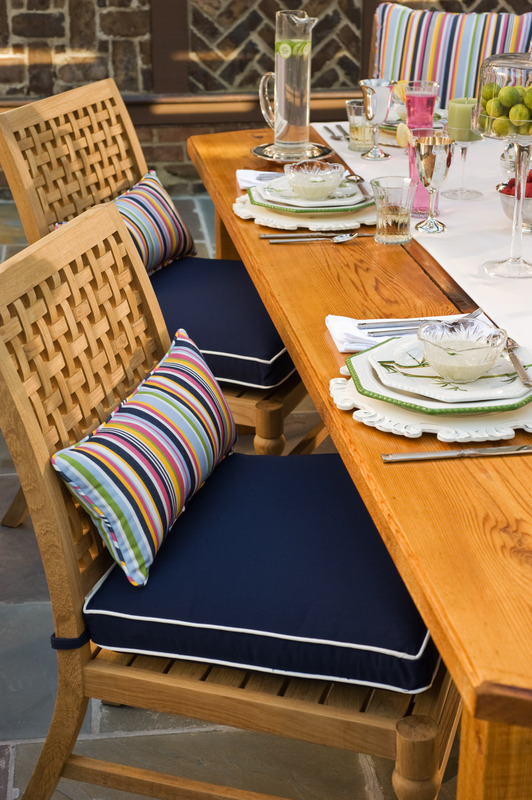 Outdoor dining set with cushions in Canvas Navy and decorative pillows in Steeplechase Malibu. Photo courtesy of Sunbrella. as toss pillows and cushions. 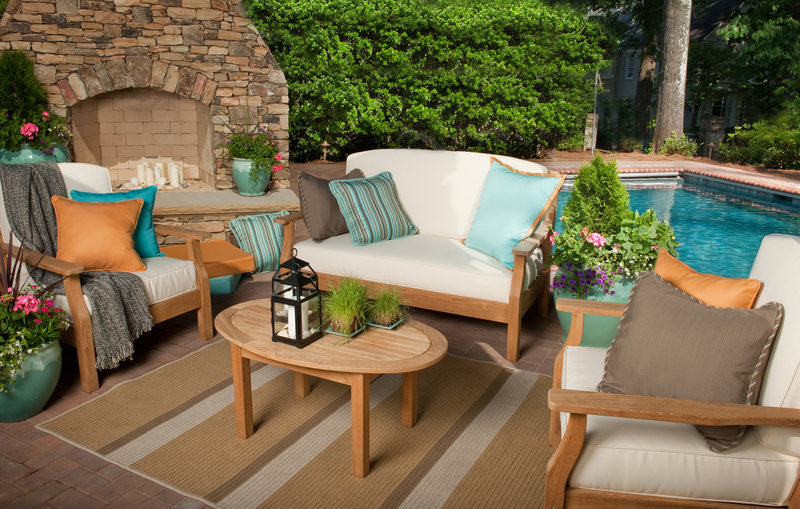 Whether the goal is to breathe life into an old patio furniture set or to start out with a fresh, brand-new new collection, adding color and life through the use of pillows and cushions can bring an exciting new look to a backyard. Selecting the right fabrics and designs can even make outdoor spaces look like extensions of a home—and customers can achieve this without having to pay exorbitant remodeling costs! up even worn chaises or club chairs. Rotating out two different sets can help bring a familiar piece back to life. For a coordinated look, choose colors and patterns that complement the interior of the house. Consider big, bold colors and patterns. Zippered pillows and cushions are easier to keep clean and maintain. If they have a table, they should coordinate the color scheme with matching tablecloths or placemats. Encourage them to have fun selecting these creative accessories! Furniture and decorative pillows in fabrics from the Sunbrella Horizons Collection. Sunbrella rug by CMI. Sunbrella throw by Textillery. Photo courtesy of Sunbrella Fabrics. One must remember that while these cushions and pillows are made out of fabric meant for the outdoors, it’s best to keep them out of harsh weather or keep them in storage if not in use. This will help avoid the fading of color or increased deterioration of the fabric.